Discussion in 'Railroad Projects and Work Weekends' started by M Kerkvliet, Jul 29, 2014. After a little mis-cue on steam school weekend, a problem area near the visitors crossing was identified and the RR crew wasted no time in getting things improved. Many feet of track was torn up, upwards of 50 ties removed, ditches dug, and drain tile installed, and of course the rail had to be re-installed and spiked. Many people have been working on this project since late June. Too many to mention (as I would forget someone) and I have driven by them time and time again, sometimes stopping to visit... but never thinking to take a photo or two of the folks at work! Believe me... these guys know how to work! I guess they are self motivated, and seldom ask me or anyone else on the board for any advice or help, so they get forgotten! That is not at all intentional! I promise to get better at getting them billing here! 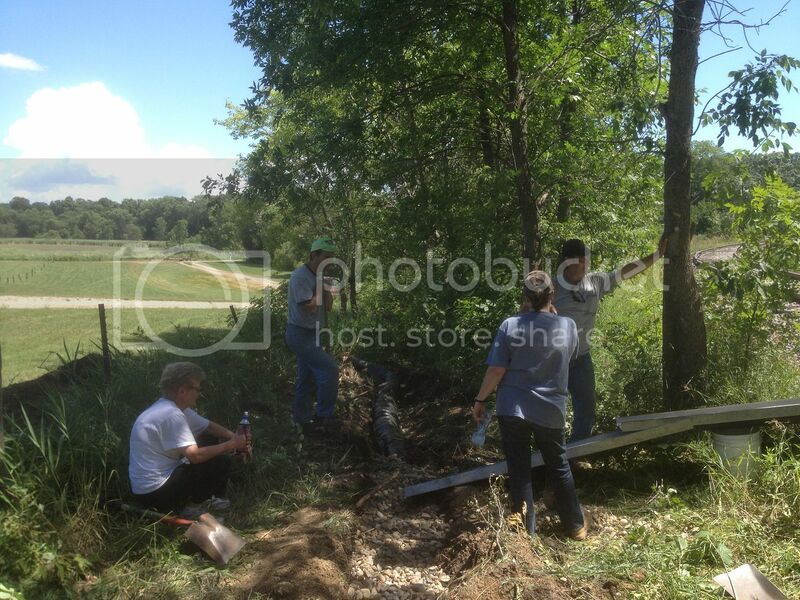 In this pic, Ken and Carole R, Raymond A, and Bonnie A are on the business end of the chute sending some rock down to cover the drain tile they put in the bottom of the ditch they dug. The idea is to dry up the RR bed. 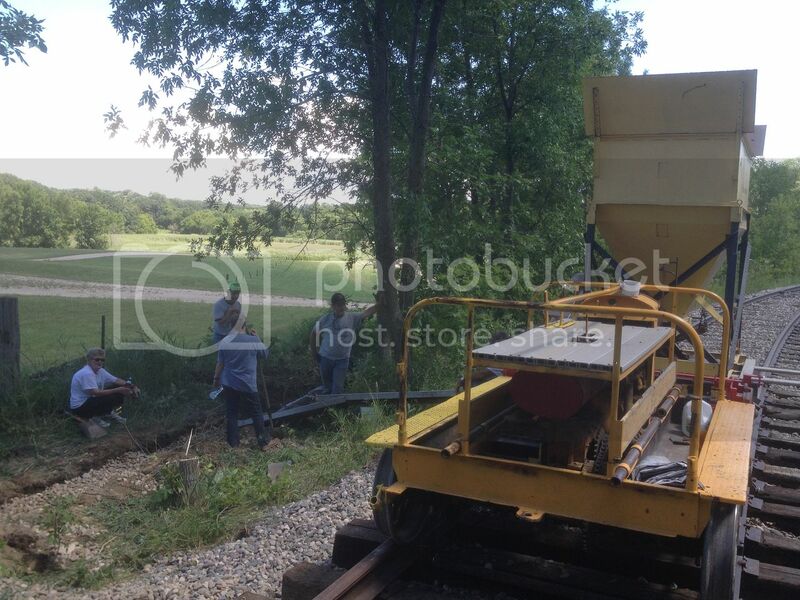 A wider shot of the same crew... (Ken still holding up the same tree) this one including "Tootles" the track hopper. Jerry A is hiding behind Tootles. It was his job to pull the lever sending rock down to the crew. Klinger was there somewhere too, as was Gary A helping the rock flow to the bottom of the chute. Later in the day, attention turned to spiking the rail back down to the new ties. Maybe some RR crew member will come by here and let us know what this project really entailed! Work has continued on the track near the visitors crossing / big grade area EVERY weekend, and a lot during the week since steam school weekend. 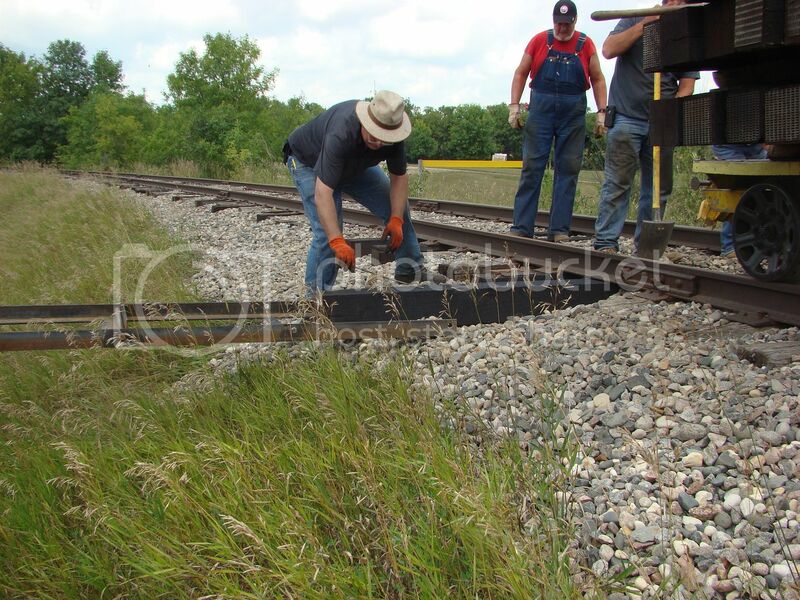 Many RR crew members travel a lot of miles every weekend for this work when they normally might not show up quite as often... this work needs to be completed before the train can run for the show. They have replaced in excess of 100 ties. 100 of them are brand new ties. The old ties were at the end of their useful life. This is one dedicated group! 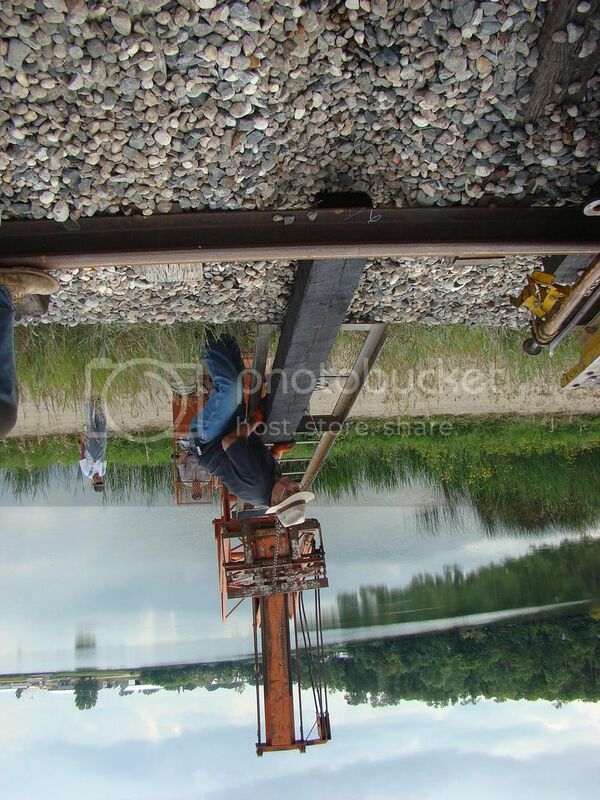 More photo's from this last Saturday when they were replacing ties. They were all on the big grade making the work more difficult. The Lull forklift with an attachment made for the purpose was used to pull and re-install the ties. Vern and Ron A. wrap a chain around the opposite end of the tie and the Lull is used to remove the bad tie. 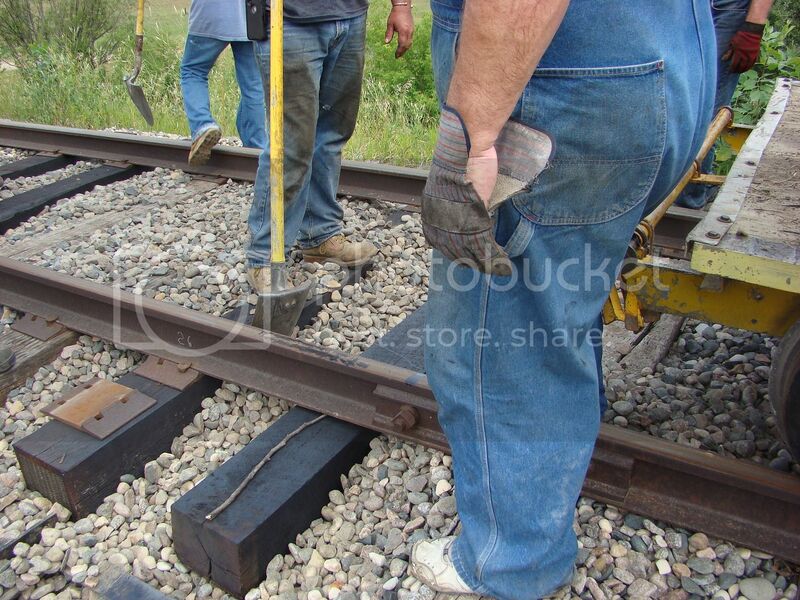 Ken and Vern move ballast aside before the new tie is pushed in. The Lull and the tie attachment are used to install the new tie. 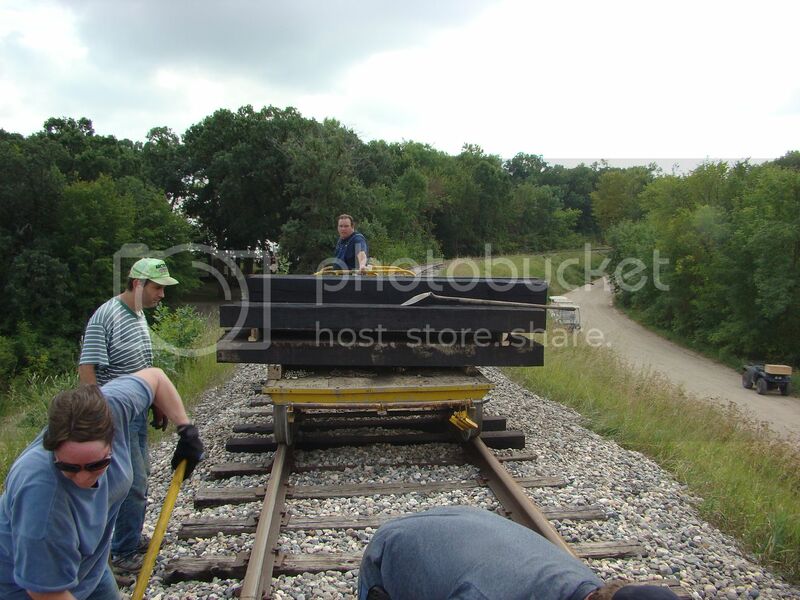 Vern guides it along as Ken works the ballast. Asher (operating the Lull) and Vern pushing in a new tie. Quite a contrast between the new and the old ties. By the way... that twig you see laying on the tie was an official tool of the trade. It was used as a gauge to determine how far to push the tie in! Very resourceful folks! New ties were loaded near the round house and hauled to the job site on a maintenance flat. 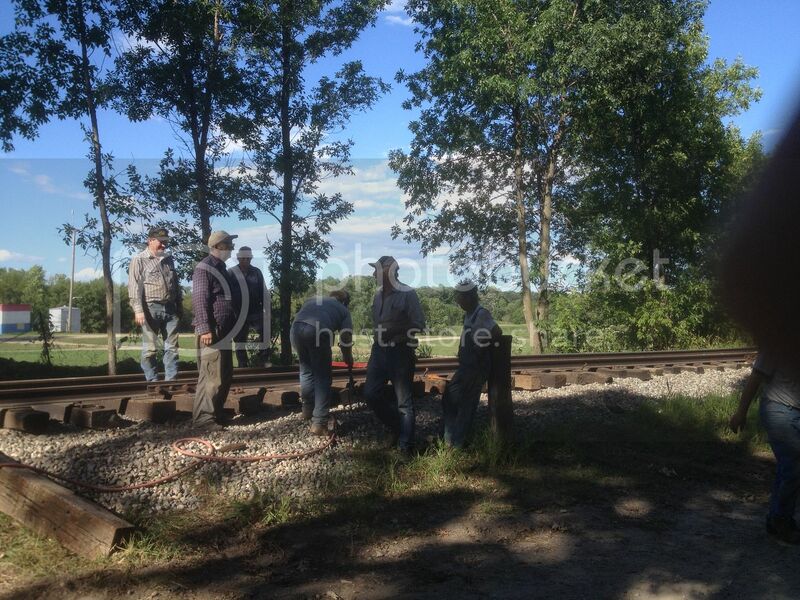 Dave W brings in the ties while Raymond A, Carole R, and Ken R work the ballast to ready the spot for another new tie. This is one of the hardest working crews on the show grounds all summer. If you see them, be sure to thank them for their efforts! Many who ride the train during the show will never see, nor understand this part of what the RR Dept. does to keep the 353 operational and the passengers smiling! How is the tie replacement going, Hope your getting help. One thing I don't understand about WMSTR there is a lot of what Iwould consider community work that needs to get done and sometimes the general membership has to step up and help. This goes for lots of projects!!!!!!! They are doing very well Jim! I think something over 200 ties replaced now. They seem to have it down to a science. 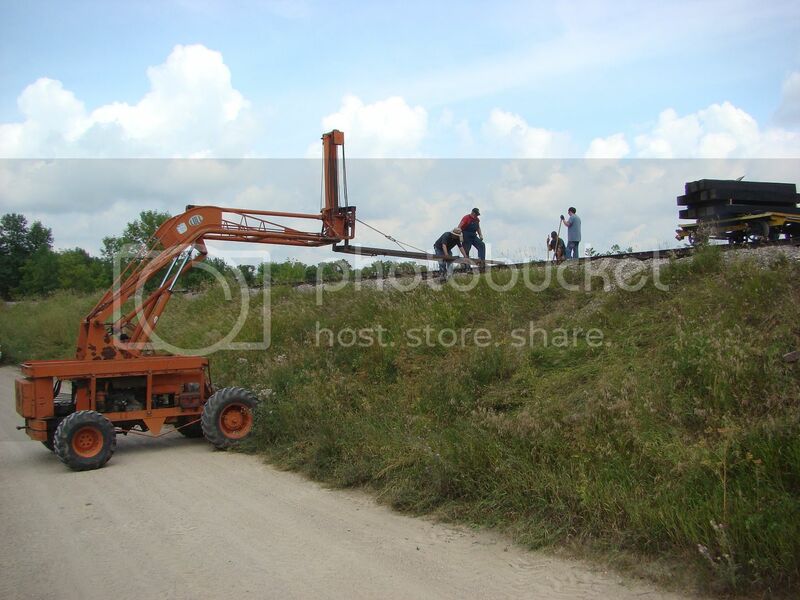 I have not been there much because of work and travel, but if someone has pictures of any of the track work being done it would be nice to see them here!